… how I have neglected you. I didn’t mean to, but life got complicated. Bookish thoughts were being crowded out of my head by practical concerns and worries. I found that the hours in the day were running out before could pick up a book let alone settle at the computer to read or write. In time though I found a new equilibrium. I found a bit more time to read and soon I found that quotes, thoughts that I really wanted to share were floating around my head again. A week’s holiday in a quiet Devon town was just what I needed. I made a point of only taking books I really, really wanted to read. One from Virago, one from Persephone, one from Greyladies, one from the Bloomsbury Group that used to be a VMC, and a Persephone in waiting. Each one a gem and I shall endeavour to write about them all sooner or later. And so a lovely week was had by all. 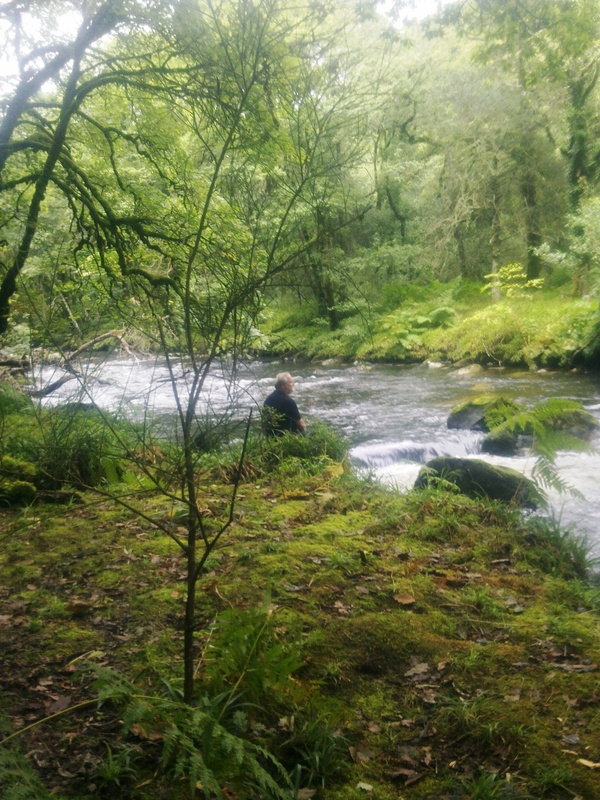 Walks on Dartmoor and by the river Dart and a lovely cottage with an enclosed garden for Briar. It was just what we needed. And so it was that my blog called me back. I decided that a little pampering was in order after such neglect. I have tweaked the name (the url is the same as ever) to take the emphasis off books and reading. I shall still be writing about books, but I’d like to feel freer to write about other things too. My mother is quite frail now and so I am doing rather more knitting and a little less reading – it’s more companionable and it requires rather less concentration. Expect more Briar and more general rambling too. And I’ve had the decorators in too. After nearly two years with the same theme it was time for a change. So now I’m ready to go. Things may be a little different, posting may be less frequent, but I’m definitely still here! It’s nice to have you back! I like the new name and design, and will be happy to read anything you post! Thank you for your kind words Laura. It’s only now I’m back that I realise how much I’ve missed blogging. Clicking “post” for the first time in ages was a very strange sensation. It is hard to find a balance sometimes. I hope you’re in a good place now, because we’ve missed you. Thank you. I’m still juggling a few too many things, but I’m dealing with it now better than I was. Welcome back!! Your new look is wonderful, and I’ll look forward to a variety of posts. Thank you. I have lot of ideas, I just need to get them out of my head and into posts! Hi Fleur! And welcome back. We have missed you too, but not to worry. We are still here. Sorry to hear about your mom, but knitting is certainly much easier when you are hanging out with someone. Feel free to write about whatever you like. I enjoyed reading about your trip. It sounded lovley. Hope you are recharged and look forward to your next post. What are you knitting on the moment? Please scratch behind Briar’s ears for me. My mother has lot the dexterity and the short term memory you need for knitting but she still reads the magazine and loves looking at yarn and patterns. At the moment I’m half way through a pair of mittens and I’m knitting Cecily Glowik MacDonald’s Idlewood with some bulkyyarn that’s been hanging around for much too long. It’s a lovely pattern. Welcome back Jane! Sorry to hear that things have been difficult, but I’m glad that a holiday has given you some rest and time for recuperation. I look forward to your reviews of the books you’ve read – you have been missed! Thank you! Life is still tough but I’ll get there. First, glad you’re back, and sorry to hear your life has been complicated. It does get messy, doesn’t it? And I am DROOLING over your two book photos! Most of the top photo are on my to-read list; haven’t heard of any in the second but I am intrigued. I look forward to reading all your reviews. And your holiday sounds heavenly. I very deliberately took “special” books that I’d been saving on holiday and they were the best therapy I could get. read them asap. The books I acquired were largely authors I knew through Virago and Persephone, so I have high hopes. I’m glad to hear that your holiday and bookshopping was rejuvenating: I’m looking forward to more chatter here as your time allows! 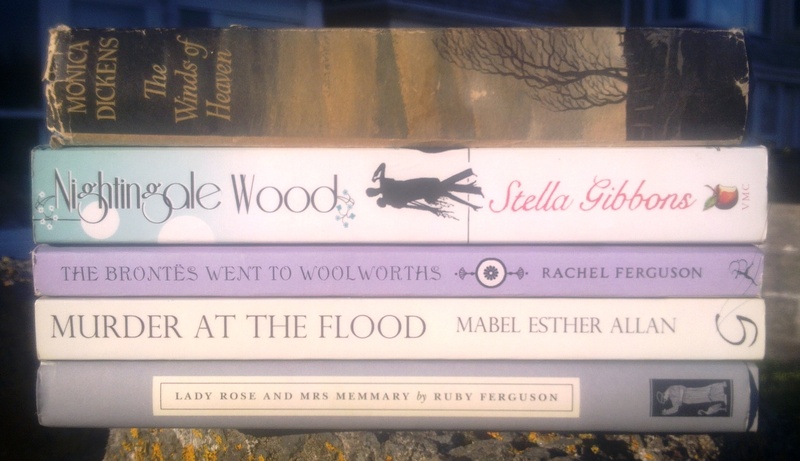 An escape to the country and some lovely bookshops proved to be just what I needed! Welcome back and thats a goodly pile you’ve got! South Devon has some lovely secondhand bookshops. I thought I might reduce the tbr on holiday but it didn’t quite work! Welcome back! I think realigned priorities are occasionally necessary too. Why should the blog stay the same if your life keeps changing? I have also been doing more knitting recently while listening to audio books. General rambling, or rambling about knitting, is certainly welcomed! Thank you, and I can but agree with your wise words. I’m more of a television and film knitter though. It was stocking stitch plus Masterchef tonight! I’m so glad you’re back. I missed you. I like the new look and your new direction. I’m looking forward to your thoughts on knitting as well as books. I really didn’t mean to go missing for so long, but I stopped for a while and then I lost the habit. But I’m definitely back now and I’m looking forward to finding out what is going on in the blogging world. Oh how lovely to see you Jane – I’ve missed you! Welcome back. I’ve realigned blog priorities too and moving away from so much of a focus on books. Looking forward to seeing the knitting – far better than mine I’m sure. Thank you for your kind words Verity. I thought of you when I found so many Virago and Persephone related books in Devon. And when I was reading Mabel Esther Allen – I’m sure it was through your blog that I discovered Greyladies. Jane, so great to see you and Briar again! Great haul of books you’ve gathered, by the way. Looking forward to your continued adventures in reading and knitting. We’ve missed you over on LT in the VMC and Persephone Groups!! Hello Cate! I keep meaning to get back to LT but there is just so much to catch up with. I’ll get there one day. I’m glad you’re back and looking good. Knitting is good therapy – at least I find it is. Knitting is definitely theraputic for me and I love the way it links generations. My mother taught me, her mother taught her, and maybe it goes further back. Lovely to have you back! can’t wait to see what you talk about. It will probably still be mostly books. Writing about them helps to fix them in my mind. But I’m going to throw in a few more things and be a little less structured than I was in the past. Time will tell! Welcome back! Hope things will be a little easier for you now and glad Devon worked its magic. Cornwall is home but Devon definitely has a place in my heart Cath. It’s a short journey but it is so different and it was lovely to spend a week walking along the riverbank instead of the prom. Welcome back. I wish I could find Peresphone books in our secondhand bookshops even out of print are hard to find downunder. I live in hope I’ll find a treasure one day. Thank you. Actual Persephones are scarce in secondhand shops but I’ve been very lucky finding other book by Persephone and Virago author in old editions. Jackie, I never planned such a long break. If I had I would have posted, but I just hit a really busy period and the gap between posts grew. I reached the point where if I carried on blogging I wouldn’t have done any reading, and then what would I have blogged about?! I love the new look and look forward to the new focus. Reading over your filling in the gaps list got me thinking how fascinating they are to read because everyone’s idea of what it means to fill in the reading gaps is different. I can highly recommend Excellent Women and The Book Thief. Welcome back and I wish you and your mother both strength and comfort. Thank you for your kind and thoughtful words Stacy. As to filling the gaps, I’ve realised that I can’t read everything and so I’m trying to focus on the books I expect to love rather that the great work or the books of the moment. And to recognise that different books speak to different people and find the ones that suit me. I love Barbara Pym, but I have a few still to read. And I have to admit that I didn’t get on with the Book Thief the first time I picked it up, but it still intrigues me. That does look a lovely pile of new books. 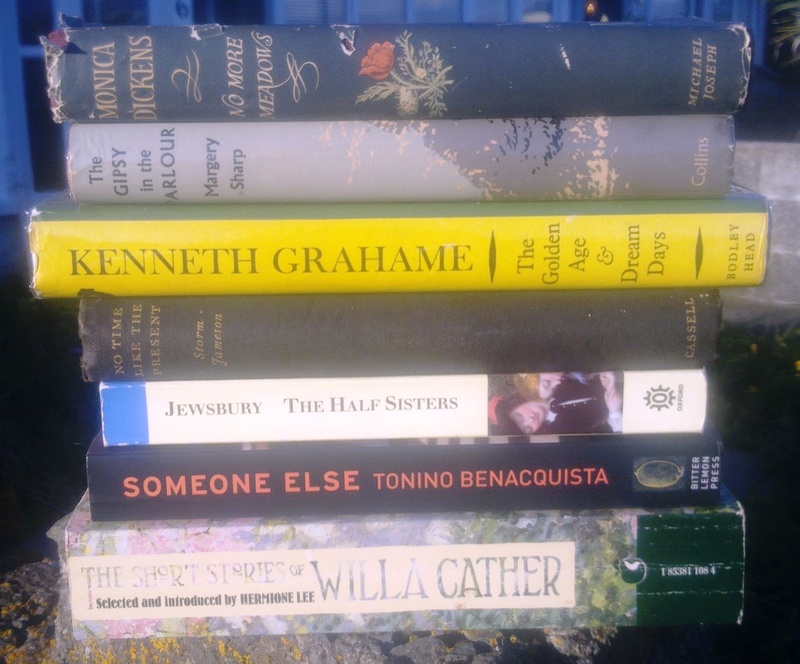 I had a satisfactory raid on a S. Devon bookshop last month, too, but I left all the books behind at my parents’ to provide me with reading on my visits. It does become a worry when parents get frail, doesn’t it? Yes, it is strange when parent-child relationships begin to reverse themselves. Tactical leaving of books is excellent planning – I used to keep a selection of books in my parent’s home when I live in London, but now both collection have merged. Lovely to see you back – I’ve missed you. So nice to see you! I was just dropping by A Bookish Space and saw your comment and was thrilled to find you back! Love what you’ve done with the place. Looking forward to more posts when you get the time and tell your Mum she has best wishes from Canada. It’s nice to be back, and thank you from me and my mother. Glad you’ve found your blogging balance. Look forward to reading about your other non-booky adventures. So thrilled that you have found a balance and I like the name change. I love to hear about your life and what you’re up to….especially the knitting!! I can so relate to what you are saying – and I am glad that you have had the courage to change and do what is best for you! You have been missed, but we will enjoy your posts whenever you have time to post – and on whatever subject you choose to focus. Good to see you back, glad to hear you had a good holiday and managed to get some balance back. Yay, glad to heard back from you :o) I am very envious of your book haul – you always seem to have such good luck! It’s so good to see your blog back again! It sounds like that was just the break you needed. I’m looking forward to hearing more about your knitting as well as the books you’re reading.